What is Email Header Template in Magento 2? The Email Header Template in Magento 2 is the content on the top of the email template which is sent automatically as a message from your Magento 2 web store. Logo and store contact are usually included in the email header template, and of course, you can add variables to the header to add store contact information. On the Admin sidebar, click Marketing. In Communications section, select Email Templates. 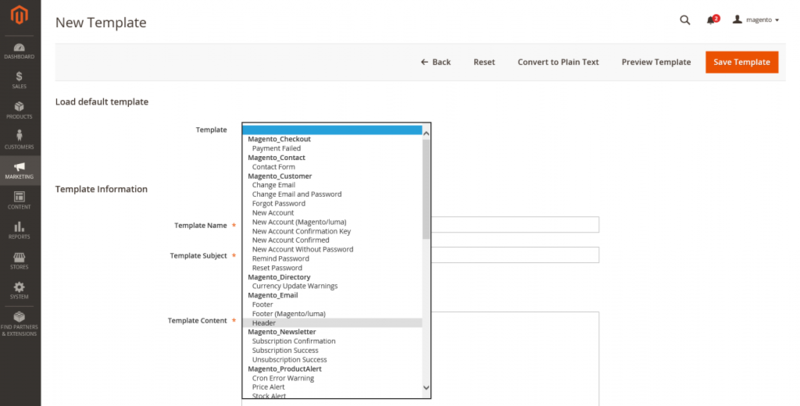 In Load Default Template, open the Template list under Magento_Email, click Header. 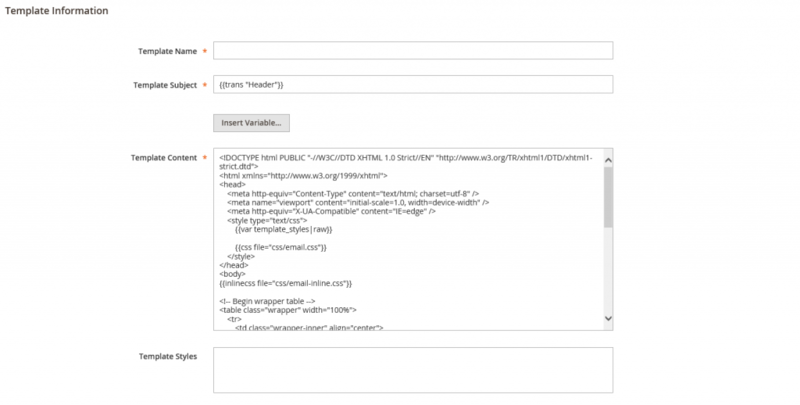 Click Load Template to display the template HTML code and variables in the form. Input the Template Subject so you can arrange the templates later. The subject column can filter and sort the list of templates in the grid. Edit the HTML code as needed in the Template Content box, remember not to overwrite anything that is enclosed in double braces. If you want to insert a variable, place the cursor in the code in the same place that the variable will display, click Insert Variable. Then select the variable you want to insert. After that, the markup tag for the variable is inserted in the code. Click Preview Template to review your header template. If you need any adjustment, just edit the template as needed. Click Save Template when you’re done. Now you can see the custom header displays in the list of available Email templates. On the Admin sidebar, click Content. After that, in Design section, click Configuration. Scroll down and open the Transactions Email. Select the default Header Template for email notifications. Click Save Config after completed. Template Name The name of your custom template. Insert Variable a Store Contact Information variable can be inserted into the template at the cursor location. Template Subject In the Subject column, the Template Subject displayed to sort and filter the templates in the list. Template Content The HTML content of the template. Template Styles In the Template Styles box, you can enter any CSS style declarations to format the template header .